Thank you for 100 likes on Facebook! Let’s head for 200! 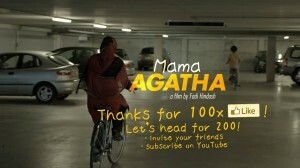 Invite your friends to like Mama Agatha – The Film and subscribe on youtube.com/user/mamaagatha. Here’s a brand new still from last week’s filming session. More and more women in the course are cycling in the parking lot and soon the first of them will head outside to the streets of Amsterdam!